Many items in stock for next day delivery. 14 day money back hardware guarantee. Our team of advisors are on hand to help. Top quality post construction with next day delivery. Create a sectioned off area in an instant with no fuss. Great value post and chain sets with a choice of colours. Crowd control retractable belt barriers and rope & post barriers. 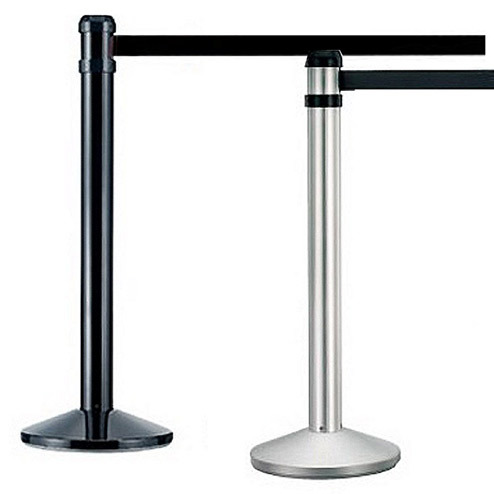 We have put together a range of top quality crowd control stanchions at discount prices. In stock for immediate delivery. Choose from tensioned retractable belt barriers in three different styles or our classic stainless steel rope and post stanchions. Ideal for banking crowd control and sales barriers. Discount queue control solutions as part of a wider display stands system such as pavement signs and printed banners. TENSIONED RETRACTABLE CROWD CONTROL BARRIERS. 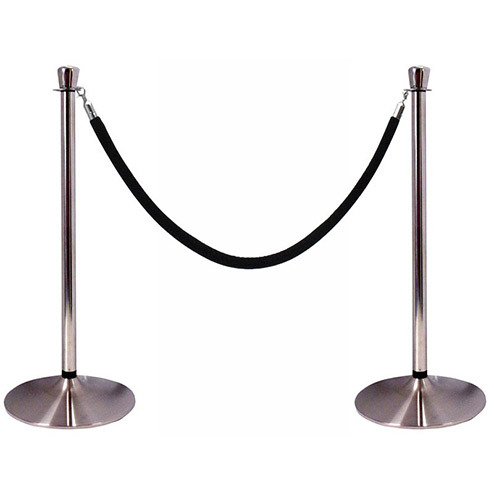 Queue stanchions available in silver or black with red, black, blue or yellow/black striped belt. Quality retractable barriers. Quality engineered to last with stable stainless steel base. 2m QUEUE MANAGEMENT BARRIER. High quality gold finish post with 2m long retractable barrier belt. Red tape and gold post are ideal for nightclubs and vip areas. Multi way connector and sturdy 360mm dia base. Discounts for buying in bulk. YELLOW POST HAZARD RETRACTABLE BARRIER. High visibility yellow post with 2m long yellow and black striped warning tape, ideal for cordoning off areas for health and safety. Stable base and steel post with powder coated finish retractable barrier. 4m RETRACTABLE CROWD CONTROL BELT BARRIER. This version of our retractable barrier has a 4m long tape for versatility and to create queue areas along larger sections. Black or silver post with 360 degree belt mounting. Webbing has a safe braking system to avoid any accidents. RETRACTABLE DOUBLE STRAP PEDESTRIAN SAFTEY BARRIER. Quality tension cable pedestrian barriers. Heavy stable stanchion base . Reliable mechanism . Quality guaranteed. ideal for banking crowd control. WALL MOUNTED RETRACTABLE BARRIER. Easy fixing, supplied ready to fit. Our wall mounted barrier is great for quick crowd control in high traffic areas, for example when you routinely shut off toilets for cleaning. Options for 2m or 4m long tape. MOBILE MARKETING BARRIERS. Use your crowd control barriers to advertise your brand. Retractable crowd control barriers with unique clear stanchions allow you to brand the barrier itself. Catch pedestrians eye while they queue. Discount crowd control. SIGN HOLDER FOR RETRACTABLE STANCHION. Sign holders to take slide in message. Attractive, easy to use slide in sign holder to fit our retractable stanchions. With acrylic cover. A4 portrait size. CAFE BANNER WINDBREAK BARRIERS. Create your own unique outdoor environment increase your seating area and revenue opportunity with these cafe banner barriers and windbreaks. STAINLESS STEEL TOP QUALITY. Queuing stanchions. Engineered to last these high quality stable stainless steel stanchions and ropes make ideal pedestrian barriers and crowd control barriers. Choose velour or braided rope. GOLD ROPE AND POST STANCHION SYSTEM. The gold version of our rope and post stanchion gives you another option for matching your crowd control solution to your decor. Options to buy posts and ropes separately to fit any requirements. In stock for next day delivery. 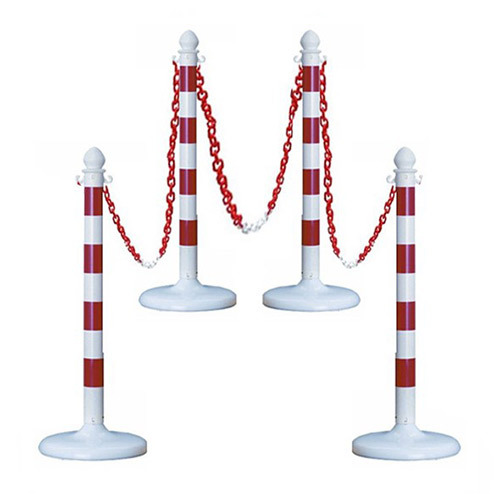 PLASTIC STANCHION WITH MATCHING CHAIN. This great value piece of kit includes 4 plastic stanchion and 10m of chain link. Matching red and white or yellow and black stripes for high visibility. Can be used indoors and outdoors complete with 360mm dia base for extra stability. ECONOMY VELVET ROPE. Velour velvet rope in a selection of 3 colours. 1.5m long, ideal for nightclubs and queue areas. Spring Closure Ends each end. In stock for Next Day Delivery. DELUXE BRAIDED ROPE. High quality woven rope for excellent durability. Selection of black, red or blue rope 1.45m long, ideal for use with rope and post systems for queue areas. Spring hooks at end to hold rope onto post securely. STACKABLE RETRACTABLE BARRIER High quality retractable barrier with shaped base naking it stackable and easy to store. Made from durable stainless steel. Versatile Road Safety system. Use for traffic management, construction sites or for any indoor or outdoor crowd control requirement. Range of complimenting products, base post and belt unit with options. TENSATOR BARRIERS. Wide range of Tenssbarriers and wall mounted Tensa barriers with patented belt braking system and high quality construction. Select from various post and webbing colours or print. Retractabarriers and crowd control are often used as part of an exhibition or event display alongside banner stands and promotional stands. If you're attending an exhibition this blog has marketing hints and tips to get the most from your event.